I’ve had quite a few business trips over the last few months, but this week’s expedition to Frankfurt came together in a particularly satisfying way. I was only there for one full day, but thanks to cunning planning of my flights and a relatively brief business meeting, I had plenty of time free to explore the city’s museums and to take two very exciting trips to nearby towns. In a blissful stroke of luck my trip coincided with the Karlsruhe Handel Festival, so I even managed to squeeze in a performance: you can read about Arminio in another post. All in all, I had a wonderful time and here are a few recommendations if you should ever find yourself in that part of the world. If you’re pressed for time, the one thing you should see in Frankfurt is the Städel. Naturally I gravitated towards its old masters, but it also has some wonderful modern paintings. Among its greatest treasures are a very early Monet, The Luncheon, painted in 1868/9 before he took the plunge into Impressionism, and the grand portrait of Frankfurt’s most famous son, Goethe in the Roman Campagna (1787) by J.H.W. Tischbein. 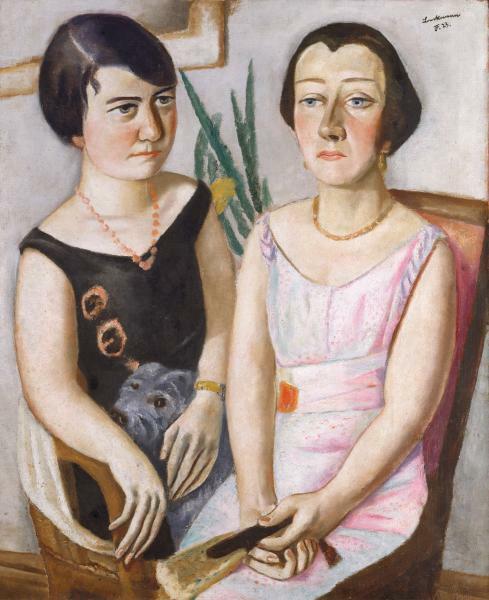 My own favourites tended to be a bit quirkier: Max Beckmann’s Double Portrait (1923), for example, which brings together the wife and mistress of the then-director of the Städel, neither of whom looks delighted with the concept. I also loved Lotte Laserstein’s bold, preoccupied Russian girl with compact (1928), and I was captivated for a while by the new acquisition, Under the Console by Edgar Ende (1933). This made me think of Plato’s myth of the cave, with most of humanity curled up in the safe, familiar darkness, while a lone figure dares to look outside and brave the light of a new world. There were also two particularly lovely Nazarene paintings, a style I’ve always been fond of because it replicates the aesthetic and style of Renaissance painting. The exquisite Head of a girl by Ernst Deger (1935) is one of the most graceful emulations of Raphael I’ve seen, while a picture that piqued my particular interest was a Self Portrait by Johann David Passavant (1818). I know Passavant as the author of important books on Raphael and early print-making and, rather shamefully, hadn’t ever realised he was also a painter and, in later life, director of the Städel. It was a delightful surprise to come face to face with him. There were some familiar faces among the Old Masters such as Vermeer’s Geographer (1669). It goes without saying that it’s a masterpiece but to see it in the flesh is to be struck all over again by the sheer perfection of its lighting. I was also very happy to see Bartolomeo Veneto’s Flora, probably a portrait of a courtesan, which used to be thought a picture of Lucrezia Borgia and still appears on covers of her biographies: it’s a knowing, sensual picture, a symphony in white and green and blue. There’s a serenely beautiful Madonna and Child by Perugino, in which the Madonna looks more like one of his Perugian Sibyls; and a little Narcissus by Altobello Melone, who with his long blond hair has the individuality of a portrait. And I was amused by a Portrait of a man attributed to Lucas Franchoys II, which shows a debonair chap who holds a letter loosely in one hand and rests his head on the other in a dandyish gesture. The portrait has a melancholic tinge, but the sitter seems too self-satisfied to really pull it off. There were Tiepolos – though I’d see plenty of those another day – and a remarkable altarpiece made for the Frankfurt Dominicans by Hans Holbein the Elder, in which the wings present the genealogies of Christ on one side and the Dominican order on the other, with curling vines connecting the different generations. But perhaps the most shocking and memorable painting was Rembrandt’s Blinding of Samson. It’s bloody, violent and visceral: one soldier has grappled Samson to the floor; another points a halberd at him; another wrenches back his wrists with a chain; and a fourth grinds a sharpened stake into his eyes with gruesome concentration. It’s a macabre, magnificent thing. Very quickly: if you’re interested in works on paper, the Städel also has a superb collection of prints and drawings. I was able to spend a few hours in their study room poring over their French 16th and 17th century drawings, and also had the chance to look at three of their great treasures: Titian’s forceful drawing of St Sebastian, preparatory for the Averoldi Altarpiece, Raphael’s silverpoint study on pink paper for The School of Athens, and his pen drawing for the Disputà in the Vatican. But they have all sorts of other wonderful things too, and the friendly team are keen to make the public more aware of the collection. For a taster, have a look at this catalogue; for opening times and appointments see here. Just around the corner from the Städel is the Liebieghaus sculpture collection, which when I was there had a temporary exhibition called Dangerous Liaisons, about the porcelain, prints and paintings of Rococo France. I’m not a big fan of porcelain, but one of the most delightful pieces in that show was a little statuette of a very fashionable lady having her vertiginous hairdo done, while the hairdresser teeters over her on a ladder. To my delight, there were three robes à la francaise in flowered silks on loan from the costume department of the Frankfurt Opera, but unfortunately no photography (or dressing up) was allowed in the exhibition. As for the permanent collection, there’s an impressive assembly of material including some good classical antiquities. For example, there was a sculpture of a rather adorable Sumerian worshipper in a fringed kilt, a mummy portrait of a pretty young girl with large dark eyes, a Tanagra-style figurine of a coquettish woman and a funerary bust of a smart Palmyran woman, who was making a strange horned gesture with her fingers. The medieval section had a case of 9th-century ivory plaquettes, one of which showed a scene at Mass with a choir of monks singing lustily away at the lower edge, and a most peculiar walnut sculpture of Christ and St John the Evangelist, in which John leans dreamily against Christ’s shoulder and Christ stares over his head in the manner of a sinister Svengali. I also fell very much in love with a painted hardwood 15th-century sculpture of the Madonna and Child. It’s not the largest museum, but there are plenty of things to see and it’s especially fun at the moment with the Dangerous Liaisons show in full swing. For my two trips outside Frankfurt itself, see the next post and for Arminio, see here. I am struck by your comment about Deger’s Head of a Girl. Is there any more information about the subject? Deger Portrait of Jesus looks like himself and is being sold as posters and lithos all over the world. Hello Regina. I’m afraid I know no more about the painting than that, so I would suggest that you get in touch directly with the Staedel. I’m sure they have some kind of dossier on the picture and they should be able to supply you with much more detail than I can!